The Preqin Quarterly Update: Hedge Funds, Q3 2015, revealed that macro strategies funds accounted for 30% of fund launches in the quarter, the largest proportion since Q3 2013 when they accounted for 29%. 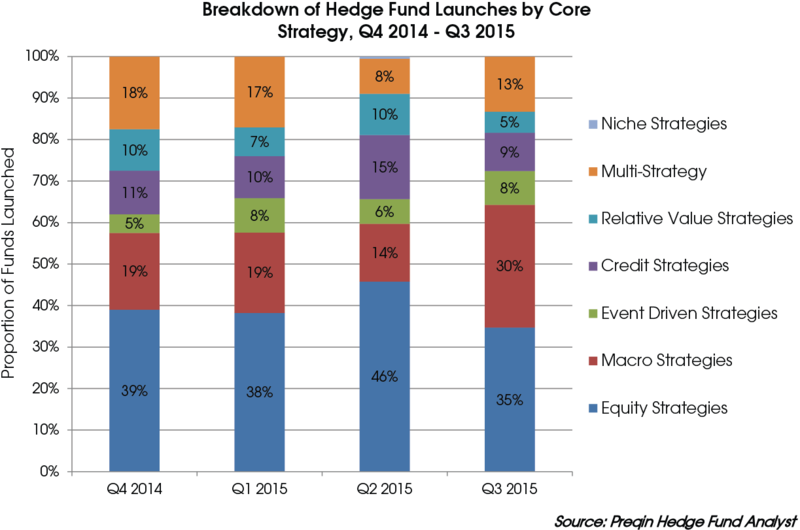 In the previous quarter, macro strategies represented 14% of all hedge fund launches. On the other hand, equity strategies accounted for 35% of launches in Q3 2015, compared with 46% of launches in Q2 2015, yet still constituted the greatest proportion of launches. Macro funds are widely considered to be the most flexible hedge fund strategy, typically investing on a global basis and utilizing the full gamut of financial instruments to capitalize on macroeconomic trends. While many of these funds have struggled for trading opportunities in the low interest rate environment (recent high-profile cases of macro fund liquidations include Absolute Return Capital and Fortress Investment Group), for the year-to-date they have demonstrated strong performance against the hedge fund industry as a whole. In September 2015, the Preqin Macro Strategies Hedge Fund benchmark (which encompasses pure macro, commodities and foreign exchange strategies) has thus far exhibited superior returns of 2.17% YTD against the Preqin All-Strategies Hedge Fund benchmark return of 0.34% YTD. However, the All-Strategies Hedge Fund benchmark outperformed macro strategies over the longer term; the annualized five-year return stood at 6.37% compared with macro strategies’ 5.14%. Within macro funds, commodities funds have achieved the lowest return, -4.63% YTD and -0.97% five-year annualized returns, whereas pure macro strategies have posted the highest YTD return within macro strategies at 3.36%. Pure macro strategies also outperformed the Preqin All-Strategies Hedge Fund benchmark over the longer term, posting an annualized five-year return of 6.51%. Commodities funds’ low returns are not compensated for with low volatility, with three-year annualized volatility of 4.66%. In spite of this, the Preqin Macro Strategies Hedge Fund benchmark achieved a relatively low volatility of 2.51%, lower than the All-Strategies Hedge Fund benchmark figure of 3.76%. As pure macro strategies outperform the overall hedge fund market it is likely that this launch trend will continue, as attractive returns and lower volatility draw in investor capital.